Marking the center of Piazza di Spagna, the unique 17th-century Barcaccia Fountain is one of the most famous in Rome. Commissioned by Pope Urban VIII Barberini and designed by Pietro Bernini, the fountain sits at the base of Rome’s Spanish Steps and is a popular gathering spot in the square. Barcaccia means “old boat” in Italian, and the Fontana della Barcaccia’s Baroque design of a half-sunken ship is said to be modeled on a ship that was deposited on this spot after the Tiber river flooded in 1598. The fountain features two masks on either end of the central marble boat that spout water, and motifs featuring the sun and bees taken from the Barberini family coat of arms. 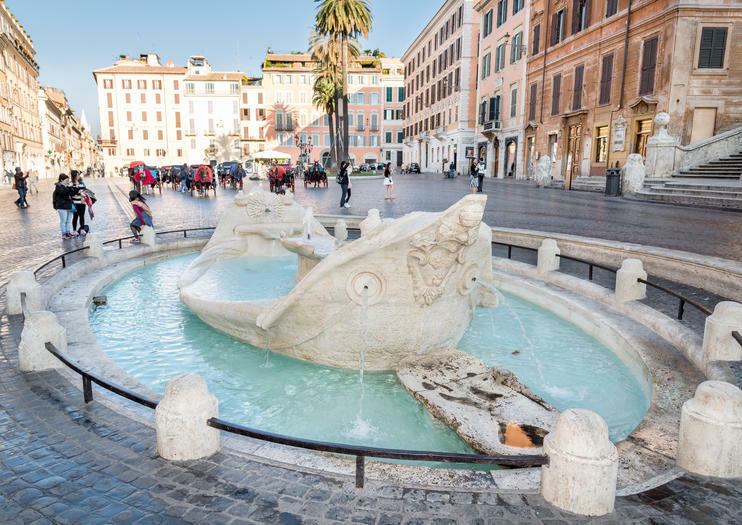 Rome walking tours or hop-on hop-off bus tours are a great way to see the Barcaccia Fountain along with the Spanish Steps and surrounding Piazza di Spagna. You can opt for a small-group or private fountain and square tour that also includes the Trevi Fountain and Piazza Navona, or a Rome highlights tour that stops at other famous attractions like the Colosseum, Roman Forum, and Pantheon—often with skip-the-line access. For a unique look at the fountain, consider joining a small-group night tour to see the fountain dramatically lit. Sitting on and bathing in the fountain is forbidden, though you can drink the water from the fountain spouts. The fountain is encircled by a low metal fence and is not accessible to wheelchair users. The house where English poet John Keats lived, now a museum dedicated to his memory and works, is located just opposite the fountain. Be aware of your surroundings and watch for peddlers who will thrust a rose or other souvenir into your hand and then demand payment. Metro line A runs from the Termini train station to Piazza di Spagna. Piazza di Spagna and the Barcaccia Fountain are crowded most of the day, so you'll have to visit early in the morning or late at night if you want to enjoy them in relative peace. The fountain is a good stop during the midday hours in summer, when you can take a cool drink from the spouts. The water flowing in the Barcaccia Fountain comes from the Acqua Vergine, an aqueduct built in 19 BC that still provides clean drinking water to much of central Rome. Spend 2.5 hours learning about some of Rome's top food spots during this small-group walking tour. See a few of the main sights in between sampling goodies like the best gelato and espresso in Rome. UNESCO–listed Rome is home to ancient treasures dating back thousands of years, but the city’s secrets can seem lost in the sands of time. On this tour, discover top Rome attractions including the Spanish Steps and Trevi Fountain, and delve underground where a hidden aqueduct runs between subterranean ruins. With your archaeologist guide shining a light on the days of the emperors, see sides of Rome many visitors miss. See the main sites and hear all about their intriguing history on this info-packed and entertaining 2-hour walking tour of Rome. Get an up close and personal look at the Pantheon, Piazza Navona, Campo de' Fiori and much more. Kill a few hours before your cruise with this 3.5-hour private Rome tour. Led by your own private driver-guide, the tour takes in all the major, must-see landmarks including the Spanish Steps, Trevi Fountain and Colosseum. Hear the history of the city, enjoy several photo stops, and then finish with a drop-off at Civitavecchia Port in time for your onward cruise. Luggage can be taken on this tour. Get an in-depth look at some of Rome's most public art with this private 3-hour walking tour of the city's famous squares and fountains. Join a guide with expertise in archaeology and art history to learn about some of Rome's hidden treasures of art and history. Enjoy the personalized attention of the guide for just for you and your group. Live ‘La Dolce Vita’ in Rome on a 1960s-themed tour of the city including the locations featured in Federico Fellini’s classic film. Stroll down chic Via Vittorio Veneto — once a hot spot for the Hollywood jet set — see Fellini’s former neighborhood, and soak up the Baroque splendor of Piazza di Spagna. Finally, make a wish in the Trevi Fountain, famously memorialized in ‘La Dolce Vita’ and other films. This is a fully private guided tour then self-guided Borghese Gallery experience in about 4 hours. Gian Lorenzo Bernini (1598 - 1680), great rival of Francesco Borromini and Michelangelo's natural successor, was a religious man who worked closely with the papacy during his time in Rome. Much of Bernini's Baroque sculptures and architecture can be appreciated in modern day Rome. Time spent with your local expert guide is approximately 3 hours. After your fully private guided tour experience, you will be given priority access tickets into the Borghese Gallery for the self-guided portion. Recommended time inside the Borghese Gallery and Museum c. 1.5 hours. See Rome’s spectacular Baroque sites on a three-hour walking tour that explores Roman squares, fountains, palaces, and churches from the 17th and 18th centuries. With an expert guide to help bring the architecture to life, you’ll see top highlights that include the Piazza del Popolo, the Spanish Steps, the Trevi Fountain, and more, using a headset so you don’t miss a word as you walk. This 3-hour Roman Baroque walking tour is led by an art historian guide, and it’s limited to 15 people for a more personal experience. Get to know the Eternal City with a 3-hour introductory walking tour of Rome. Learn about some of Rome's famous history, art, and architecture from a knowledgeable guide to begin your visit to the city. See the highlights in Central Rome made famous by classic movies on a short stroll through the city. Visit the Spanish Steps and the Trevi Fountain, and learn the ancient history and Hollywood history of each. This is an engaging experience for movie buffs and pop culture fans who want to relive some of the most classic scenes from the silver screen. Discover the most evocative archaeological findings above and under the city of Rome.